As someone seriously interested in rocks for the past 25 years or so and building stone for the past dozen, I am embarrassingly bereft in my practical knowledge of pounding rock. 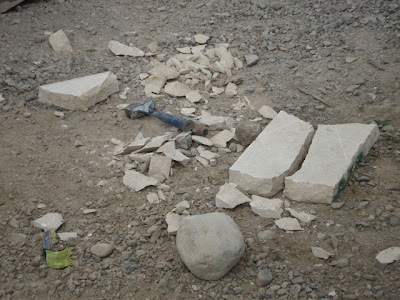 Yes, I have whacked rock on many an outcrop (and, of course, played numerous rounds of rock hammer golf), but never had I hammered rock with the goal of creating a shape, such as a letter or block, or even watched someone else hammer rock, until StoneFest. As I stated in my previous post, it was a revelation. Stone and hammer: some of life’s simpler pleasures. The master stonemasons were a joy to watch. Each time their hammer or mallet struck the chisel, it was done with confidence. The confidence manifest itself in three ways. First, was in having the right tool. Second, was in locating the chisel at the right point to take off the precise piece they needed, and third, was to hit with the right amount of pressure. They were the masters of the rock. But they also knew that stone could be capricious and they did make errors. 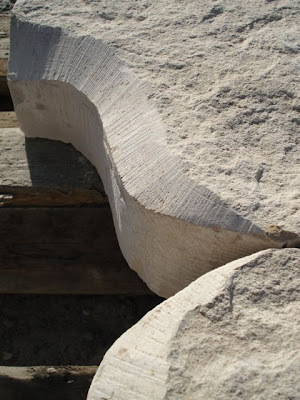 Keith Phillips showing the various textures one could apply to stone with a hammer and chisel. I especially enjoyed watching Keith Phillips, who is the master stone cutter at the Tenino Sandstone quarry, 20 miles or so south of Olympia, Washington; and Nathan Blackwell, 87 years old and still making his own tools and cutting stone. They helped one of the students cut an S-shaped curve called an ogee. Nathan was particularly impressive, getting into a hitting rhythm as he trimmed along the curve, took off surface rock, and began to cut out the shape. It was if the tools were extensions of his hands. Within minutes the block had metamorphosed from a rock to an arch. Nathan Blackwell at work. 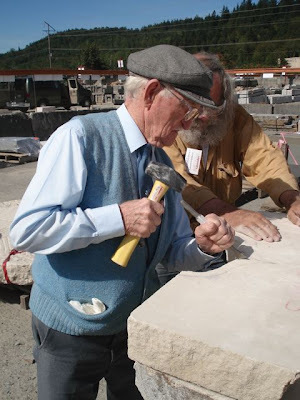 An exemplary gentleman who always wears a tie when cutting stone. The final product: an ogee arch cut with a hammer and chisel, the marks of which give the arch its texture. 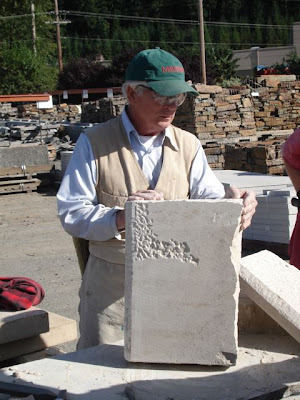 Keith Phillips said “Oh, some people say, it’s just stone but we are trained to be accurate, to build a building that will last 100 years.” Keith’s comments gets to the heart of the passion I felt at StoneFest. These were people dedicated to making high quality and often beautiful products that would endure. In our modern age of prefabrication and machine made items often put together half way around the world, it was a treat to watch these people work with tools that had basically remained unchanged for centuries. I know that I forget the amazing items that talented people can produce. It was both a revelation and a reaffirmation of the human spirit.